In this town, locally-driven menus are something of a rarity. Thank goodness for ‘town, a newish slick urban bistro located in the tony Avondale shopping strip. There’s been a lot of buzz about town about ‘town, and after a few visits I can certainly understand why. 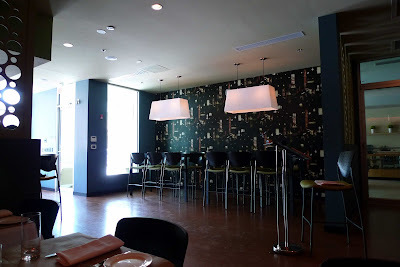 'town has a modern, playful décor, with fanciful bubbly light fixtures that run the length of the main dining area. This main eating area has been designed with a classic bistro in mind – a long row of tables with bench seating along the wall and chairs on the other sides of the tables. 'town has two bar seating areas. Incredibly, for such a small space, this doesn't seem awkward at all. The front bar is the proper bar where drinks are made and the other overlooks an open kitchen area where you can watch the chefs prepare your meal. You can also sit outside at a few café tables on the sidewalk. ‘town really puts off a sophisticated, big city vibe and couples it with the approachability I love about dining in the South. While there are a few Jacksonville restaurants that serve foods from local farmers and producers, few make it widely known that they are sourcing their products from our area. There has certainly been a small but burgeoning sustainable food movement in Jacksonville but we are far, far behind other cities in our attention to sustainably- and locally-produced foods. As consumers, we need to support the restaurants that are leading this trend. Orsay deserves a special mention here. Last month Orsay partnered with Slow Food First Coast on a farm-to-table dinner that showcased local farms and other producers, and the restaurant recently announced it will donate 25 cents for every Gulf Coast Oyster sold to the Gulf Coast Oil Spill Fund. And now, we have ‘town. 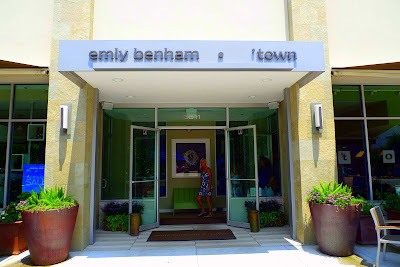 A section at the bottom of the restaurant’s menus announces that ‘town proudly features local farmers and lists Twinn Bridges, Eli’s Raw Foods, Sweetgrass Dairy, White Oak Pastures, Magnolia Farms, and Down to Earth Farm as local sources. These farmers and producers deserve way more credit than they get for battling with the area’s unforgiving summers, periodic torrential rains, and ravenous bugs. So I am overjoyed that they are listed on ‘town’s menu and I urge every restaurant that sources their products from local businesses to please give them credit on your menus. That way we Jaxites can begin to understand a bit more about where our food comes from and recognize and support our area’s independent farmers and small producers. Okay, let’s get to the food at ‘town! I love the way the menu is set up. It’s divided in sections based on price, so you have your list of $5 bar bites, your $4 cheese and charcuterie options, and your appetizers and mains which have different prices depending on whether you’re lunching, brunching, or dinnering at ‘town. It’s such a clear and concise organization and there are tons of options if you’re looking to spend a little on snacks at the bar or have a more substantial – yet still well-priced – sit-down meal. I’ve been for brunch and dinner, and here’s what I thought. Weekend brunch for me either begins with coffee or a cocktail, depending on how much fun I had the night before. 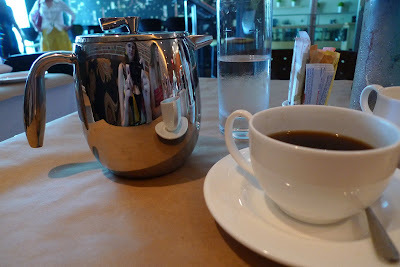 The afternoon in question was a coffee kind of day, and ‘town serves theirs in a slick and shiny French press. For those of us who enjoy a little interactivity served up with our meal, the French press provides just that… but not too much so as to confuse you before you’ve had a shot of caffeine. Wait five minutes then slowly and gently push down the plunger to filter your brew. Pour, and drink. Voila. We were hungry. 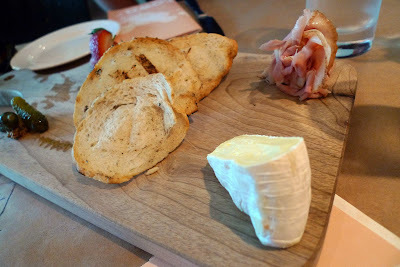 My table of three started off with a charcuterie sampling of house-smoked duck and Sweet Grass Dairy triple cream brie on a wooden serving platter with thin slices of toasted bread, a few cornichons, a dollop of whole grain mustard, and a sliced strawberry to provide a sweet note. Each element was served in a very small portion, but really that’s the whole point of a charcuterie platter. A little bite of this and a nibble of that to whet your appetite and signal the delicacies to come. The duck tasted like a cross between bacon and prosciutto (yes, you read that right, are you getting in your car yet to go to ‘town?) and was well-complemented by the mustard and tangy cornichons. The clean and grassy triple cream is one of my favorite cheeses from Sweet Grass Dairy, and ‘town served it at the perfect temperature so it was melty and luscious and spreadable on the toast. I shared this brunch experience with good friends who like to share, so we ordered a few dishes and, well, shared them. Next out of the kitchen were the smoked salmon beignets. 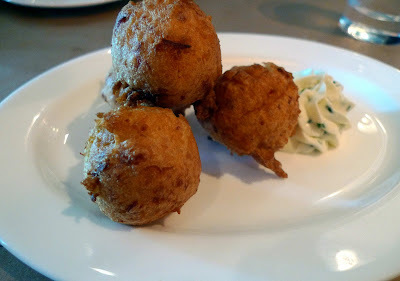 The beignets resembled hushpuppies in appearance but were light and airy and subtly flavored with smoked salmon. Perhaps a bit TOO subtly flavored. Give me some more of that smoky salmon, please! The menu says the beignets were served with chive cream cheese but it seemed more like a chive butter to me. Regardless, it went well with and was easy to slather on the beignets. The timing of this brunch was impeccable. As soon as we finished the beignets, the rest of our food came to the table all at once. Witness: omelette with house-made sausage, fresh herbs, and more of that smooth triple cream cheese. The sausage was salty but it worked well with the mild cheese. The substantial omelette came with a salad of mixed greens. Now that I’ve moved to the South, I can’t fathom brunch without creamy grits. 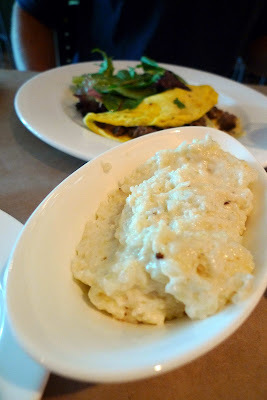 ‘town uses Anson Mill stone-ground grits so the finished dish has a bit of texture and bite to it – these aren’t smooth-as-baby-food grits. They were so rich and creamy that a scattering of cheese was unnecessary. My favorite dish of the afternoon was the potato, bacon, and onion hash topped with an egg. This dish may sound simple, but it included chubby bacon lardons and a faint-inducing budin blanc (white sausage) that infused the whole dish with their flavor. 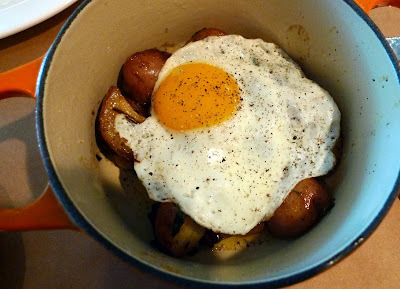 The hash was served in a mini Le Creuset cast iron pot that was not only absolutely charming but also served to keep the hash hot throughout our meal. The dish came to our table with the lid intact and the server removed the lid tableside – extra points for presentation and flair! When I broke the yolk of the sunny-side farm egg it oozed into the dish and coated the hash like a rich sauce. I was glad we'd ordered the grits to sop up every last bit of bacony sausagey eggy flavor in the bottom of the pot. I suggest you do the same. 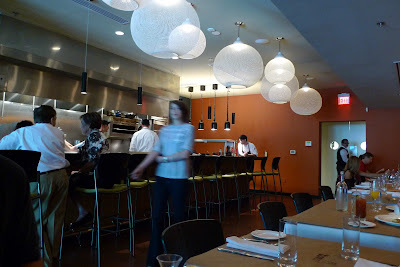 Impressed by my brunch experience, I returned to ‘town for dinner that very week. I must say that the $33 three-course prix fixe menu greatly affected my decision to return so quickly. ‘town’s prix fixe is different from most for three delicious reasons. One, ALL of the menu items are eligible as a course for the prix fixe. Did you get that? At ‘town, there’s no special separate menu listing the items you can choose for each of your prix fixe courses. I sometimes feel like restaurants put their cheaper dishes on the prix fixe menu. So, because I always find myself drooling over the descriptions of the “regular” menu items, I rarely go for the fixed price meal. But here, every single delicious-tasting item on the regular menu is game for the three-course prix fixe. Nothing’s off limits. Ah, a life without restrictions! And that brings me to the second reason why ‘town’s prix fixe is unique. It’s really affordable. $33 for dishes made with sumptuous, luxurious ingredients like lobster, sirloin, scallops, duck, veal? A steal! And third, the prix fixe menu at ‘town does not include a dessert course. You heard me right. Anyone who knows me well knows I’m not really a fan of dessert. I’ve got a savory, not a sweet, tooth. There you have another reason I rarely order a fixed menu from restaurants. They inevitably include something sweet at the end, and really I can just do without. I’d rather pick an app and main from the regular menu and spend as much as or less than the prix fixe. So with that explanation out of the way, let’s get to the food, shall we? Dinner started off with a plate of warm and chewy rosemary bread served with a little vat of sweet almond butter. When a restaurant puts this much thought into their butter I expect great things from the rest of the meal. And while dinner at ‘town had a few minor kinks, overall my four friends and I had a memorable experience. Of the first course, our favorites were the fritto misto and the heirloom tomatoes with a lightly dressed salad and a dollop of fresh ricotta. 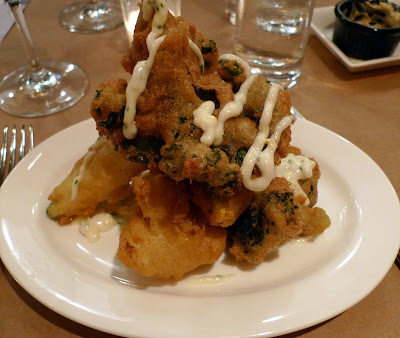 The fritto misto was an assortment of vegetables expertly fried in a light, lemony batter. I especially enjoyed the kale. I’d never had it fried this way and loved how the flavor of the green and leafy vegetable held its own against the batter. 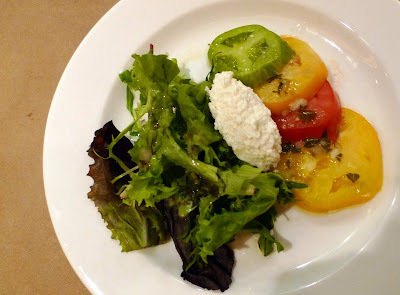 The colorful heirloom tomato salad was a special of the day and the ricotta was clearly of a high quality as it was light and tangy and not at all grainy like that nasty stuff you get at the supermarket. The dishes that got us most excited from the second course were the duck confit and grilled warm water lobster. 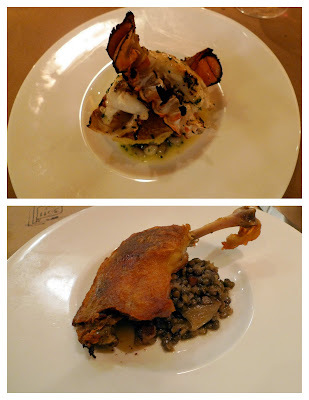 The duck was served over French lentils flavored with bacon and shallot. It was everything a confit should be: meltingly tender meat with a crisp, salty skin. The lobster was served in its shell perched atop a sweet corn cake and black-eyed peas in a chive butter sauce. Although the corn cake was a bit too thick and pancake-y for me, the peas were clearly fresh and retained their shape and texture. 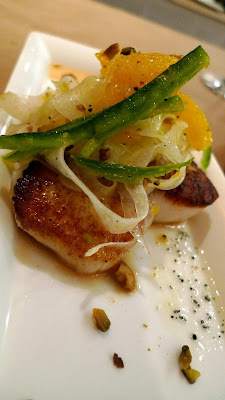 I was excited to try the scallops with fennel, orange, jalapeno and cardamom vinaigrette. Indeed, the scallops were large and well-seared, and while the accompaniments had a lot of potential – I love the combination of fennel and orange and thought the spicy jalapeno and warm cardamom would really elevate the dish – unfortunately the flavors did not pop. I wished the fennel tasted more, well, fennel-y. I think they may have marinated the slices of fennel in something that took the anise-like bite and crispness out of the vegetable and rendered it almost flavorless. I even asked our waitress if it was daikon. 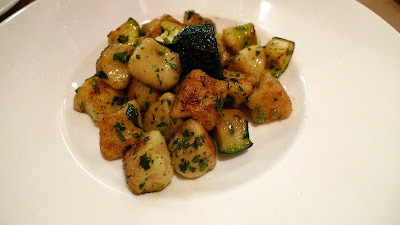 The buttermilk ricotta gnocchi had a very playful, thoughtful presentation, with little pinched pillows of gnocchi mixed with pieces of squash that were cut into exactly the same size as the gnocchi. The gnocchi held their shape and the texture was smooth and light, but I found myself wishing there was a little more seasoning in the gnocchi themselves or the sauce. I like my potatoes to be highly seasoned. Even a nice shaving of pecorino romano would have given it the salty kick I was looking for. On to course three… the standouts? Snapper and bouillabaisse. 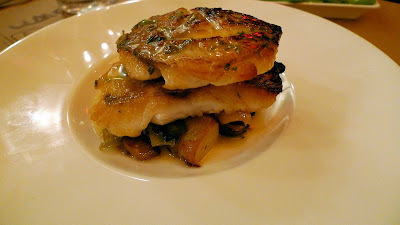 We really loved the roasted snapper with fingerling potatoes, mushrooms, leeks, and verjus. The fish was expertly prepared and generously portioned and the light verjus tied the earthy vegetable elements together. The bouillabaisse was also stand-out. It was less a soup than a stack of seafood resting in a delicate, saffron-flavored broth, and I really appreciated this almost deconstructed version. 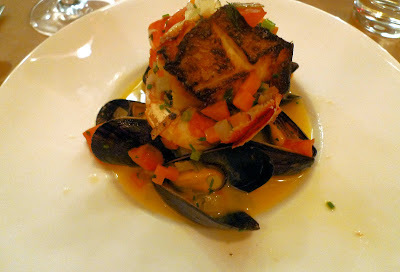 The bouillabaisse had shrimp, mussels, lobster, and snapper and there were little cubes of veggies in the broth. I wish they had brought me a spoon so I could have slurped up the broth that remained in my bowl. It was really well-seasoned and the veggies were crisp and fresh-tasting. The bouillabaisse was perhaps a bit messy to eat as it was piled high in the tiny little bowl-like indentation of a serving dish, but that didn’t really matter to me. 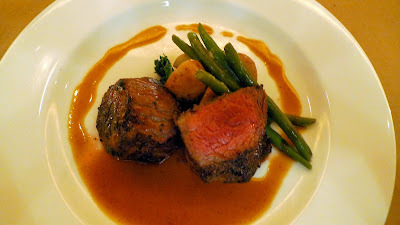 Our least favorite entrée was the sirloin. The meat was a bit tough, even though it was prepared a perfect medium. Perhaps it’s because ‘town serves grass-fed beef which has less fat than we Americans are used to. Regardless, the toughness of the sirloin has been a common complaint among folks I’ve talked to who’ve dined here. 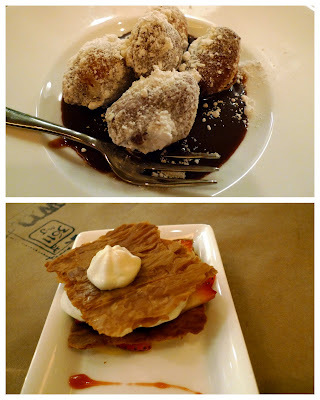 Two people decided to order dessert – it’s only $5 if you went for the prix fixe. I got to try the mini sugar donuts with milk chocolate fondue. They were good, but a little heavy and dense. Others at our table had the lemon curd and berry napoleon. I loved the presentation but didn’t have a taste. Overall, dinner at ‘town was an excellent, well-priced meal. Ironically, dinner was slightly less successful in my opinion than brunch, even though when I ate at ‘town it was only their second week serving brunch. The main issues we had during dinner were with the timing of the meal and the fact that they were out of some of the wines we wanted to try. But hey, this place is still brand-spanking new so I am SURE they will iron out these very minor kinks. Plus, the garnacha we did drink was excellent and fairly priced, so I can’t complain too much. I was so happy to see all sorts of people dining and drinking at ‘town. There were of course plenty of well-heeled folks representing the Avondale ‘hood, but I’ve also seen plenty of young and trendy types and even a family with a very well-behaved baby in tow. What about you? When are you going to ‘town? Re your thoughts on the trend of "local" foods, and why FL/Jax (with its long growing season) has resisted joining the movement - I have a theory, based on living in FL for 30 years; Floridians have developed a "learned" resistance to anything "imported" - this begins with resisting new neighbors, and extends to ideas and trends that weren't born locally. It's a long, slow evolutionary change, but it'll happen. This place looks great. I am a huge fan of a good breakfast/brunch out so we will definitely try that. The $33 prix fixe is very intriguing and my husband is interested so we will likely go for dinner as well. Still haven't tried out this place yet but we will soon - we've been traveling a lot this summer but now I am rooted again for at least three whole weeks with no trips to the airport! woo-hoo! We enjoyed our recent meal there, wonderful review.